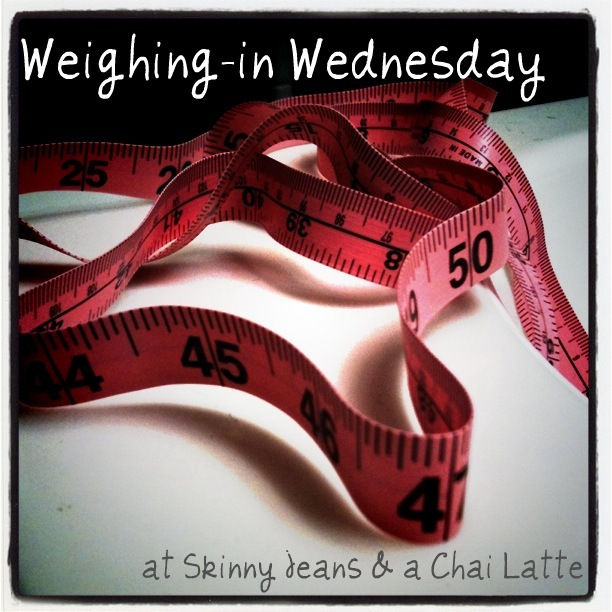 Skinny Jeans & a Chai Latte: Weighing in Wednesday :: I started half training! Well, well, well. It's about time, right? I was nervous to see the number on the scale. I hadn't weighed in since 7/14 and that was a long time ago. I knew the number would be up considering the stress and lack of consistent running, not to mention all the food and beer consumed when we headed down to Atlanta and then to the beach. When I did an impromptu weigh-in on Sunday, I was up 3 pounds and back into the 130s. That was discouraging, but I knew the whys. With school starting last week and having no food at our house, I ate particularly bad. Running won't always eliminate those terrible calories, and I believe I wasn't taking in enough. This week I am back to counting calories using Myfitnesspal. I hit up the grocery store and bought lunch and snack essentials. I'm drinking lots of water as well. Unfortunately, the official weigh in tells me I am still up by 2.5 pounds. I'm not bumming too much. I know stress and stress eating has been a major factor for me. The first step is identifying the problem, right? Now I just need to fix it. I already mentioned it, but I am ridiculously excited to report that I officially signed up and paid for the Outer Banks Half Marathon in November! I'm already noticing that it is going to take a lot of dedication to keep this up with school going on. My training plan calls for activity 6 days/week. I already skipped the strength/stretching on both Mondays and delayed last Tuesday's run to Wednesday (which meant skipping on cross training). I got right back in the game by running last Wednesday, Thursday, and Sunday. It is definitely difficult to rush out of work at 4, drive half an hour to the gym, and not get home until 7ish. Since the heat is insane, I am going to have to stick with the gym/treadmill. I will be happy when the weather cools a bit and I can resume training outside like I did in April with my 10k training. I'll be updating a little more in depth about my training and running over at a little running blog some great ladies and I have started. While I think the three of us are finding it is harder to keep up with half training, two blogs, work, and life, it's an outlet where we can share much more in depth about our running. This way I don't bombard you all with technical running jargon (because I obviously use it all the time). Good luck on your training. I know how you feel with the weight loss/gain. I have been going back and forth in the 120s over the past few weeks/months with my less than strict eating. I tried to burn off the extra calories by running harder but I just couldn't get over the hump to see it bring it down. Be sure to weigh yourself at the same time always. I weigh in the morning. If you weigh in the afternoon, you will be even more upset with yourself. Some days can be more bloating than others and I would rather not see the higher numbers. Congrats on signing up!! Yay! You're inspiring me with the weighing in. I'm going to start doing it on Sunday after my WW meetings. I'm finding myself not going everyday. I think I've kind of modified all of the training plans and I'm making itup as I go. I feel like as long as i'm increasing my long runs as I go and then am running throughout the week at different paces and distances then I'm fine. :) I'll let you know October 2nd. I think with everything you've had going on over the last few weeks, a few pounds is to be expected. Sounds like you're being realistic about it which is great. Good luck with the training! Very inspirational. Werk it girl! You are determined and that alone will get you far. I started back at pilates...can't believe how my body seizes up without it. age is a biznatch! Good luck with your half training!!! I use my fitness pal too and it's really helped to get me back on track!